Small but mighty, that is the 250ML bottle! Our extra virgin olive oil is an honest family product. 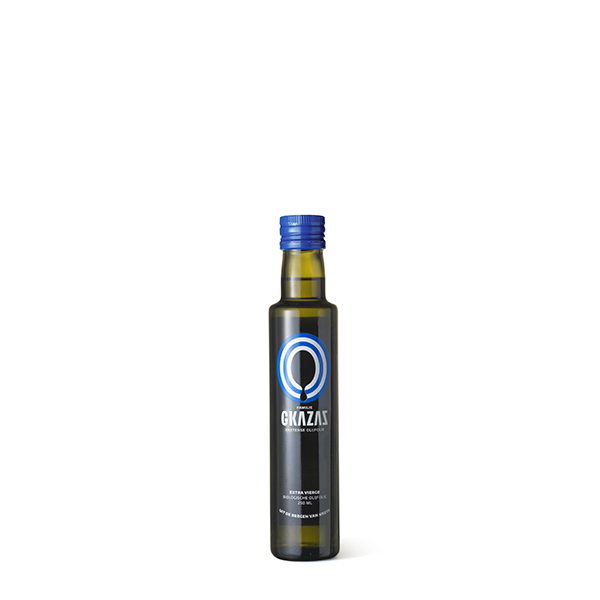 Gkazas Greek olive oil is produced by ourselves in the mountains of Crete. The elegant one! We are secretly all fond of the ‘small’ variants on big products. So it is safe to say that this edition is a must-have. The ideal present for your partner. Or for a friend that loves to cook of course. Now, ensuring the quality of the oil is as high as can be is our mission. We ensure that our extra virgin olive oil is not mixed with other oils and doesn’t know any additives. Also, it is unfiltered, organic, and cold-pressed. 100% natural! The harvesting and pressing are done by hand, the most authentic way. This authentic way of production guarantees the highest quality of olive oil. While we are busy harvesting our olives in Crete this 250ML bottle is blown to life in Eastern Europe. After months of self-filtering, our Greek olive oil is ready to be transported to the Netherlands. Here, the smaller bottles are ready to be filled. And then it is your turn to start enjoying Gkazas.